Kiss clean from day to night with our clean, vegan, cruelty-free and gluten-free hydrating Agave+ Daytime Lip Balm, smoothing Agave+ Weekly Lip Scrub and intensive Agave+ Nighttime Lip Therapy. 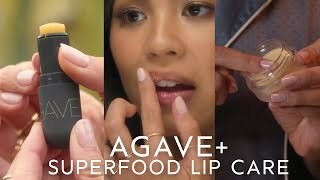 Each of these lip care products is supercharged with superfood ingredients for the lip routine that will give you your most kissable lips yet. Kiss clean from day to night with our agave and superfood lip routine. 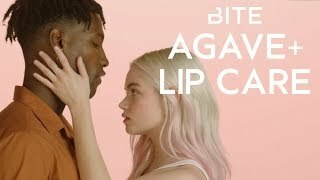 Swipe, go, kiss, repeat: BITE’s beloved Agave lip balm gets revamped and amped up so it’s now clean, vegan, cruelty free and gluten free—and with long-lasting hydration, up to 8 hours. You’ll reapply because you want to, not because you have to. Packaged in our iconic “pill,” it tantalizes with a delicious, sweet orange-vanilla flavor. We promise—you’ll love it so much you won’t want to keep it to yourself. When it’s time for bed, don’t get between the sheets with petrolatum or fossil fuel-derived ingredients: Instead, cozy up to clean, deeply hydrating plant-based oils and antioxidants for lips that are smoother, softer and more supple when you wake. Our decadent blend of jojoba, sunflower and safflower seed oils comes together in an innovative balm-to-oil lip therapy that starts as a solid but melts onto lips to wrap them in moisture all night long. Agave nectar and pomegranate extract help nourish. And, should you be inclined to actually sleep, our chamomile-bergamot dream scent sends “it’s time to rest” vibes. Pomegranate extract to help nourish and give lips an antioxidant boost. Get your lips ready for action: BITE reimagines its beloved lip scrub with a completely new innovation. This game-changing 3-in-1 scrub cleanses, exfoliates and conditions, for smoother, softer, more kissable lips. Use it before applying lip balms or before lipstick. And, it’s never been easier to use: Massage over wet OR dry lips, then rinse or wipe away. Fair trade organic golden sugar exfoliates, and papaya enzymes help lift away flakes. Ready to take off your lip color? It can help do that, too. Don’t be surprised if the addictive vanilla flavor makes you want to use it more than weekly—good thing it’s gentle enough to use whenever the mood strikes. Fair trade organic golden sugar to help scrub away rough patches and papaya enzymes to act as an enzymatic exfoliant to break down flakes. Agave+ Daytime Lip Balm Ingredients: Polyglyceryl-2 Isostearate/Dimer Dilineolate Copolymer, Caprylic/Capric Triglyceride, Oleic/Linoleic/Linolenic Polyglycerides, Tricaprylin, Cetearyl Candelillate, Hydroxystearic/Linolenic/Linoleic Polyglycerides, Octyldodecyl Oleate, Schinziophyton Rautanenii Kernel Oil, Polyhydroxystearic Acid, Theobroma Cacao (Cocoa) Seed Butter, Coco-Caprylate/Caprate, Disteardimonium Hectorite, Silica, Aroma/Flavor, Oryza Sativa (Rice) Bran Wax/Oryza Sativa Bran Cera, Triethyl Citrate, Polyglyceryl-3 Polyricinoleate, Allantoin, Agave Tequilana Leaf Extract, Ricinus Communis (Castor) Seed Oil, Momordica Grosvenorii Fruit Extract, Limonene, Linalool. Agave+ Nighttime Lip Therapy Ingredients: Ricinus Communis (Castor) Seed Oil, Triisostearoyl Polyglyceryl-3 Dimer Dilineolate, Oleic/Linoleic/Linolenic Polyglycerides, Squalane, Glyceryl Rosinate, Hydrogenated Vegetable Oil, Thus Verniciflua Peel Wax/Rhus Verniciflua Peel Cera, Helianthus Annuus (Sunflower) Seed Oil, Phytosteryl Canola Glycerides, Carthamus Tinctorius (Safflower) Seed Oil, Aroma/Flavor, Simmondsia Chinensis (Jojoba) Seed Oil, Phospholipids, Polyglyceryl-3 Diisostearate, Caprylic/Capric Triglyceride, Tocopherol, Punica Granatum Flower Extract, Ascorbyl Palmitate Agave Tequilana Leaf Extract, Momordica Grosvenorii Fruit Extract, Chamomilla Recutita (Matricaria) Flower Extract, Tocopheryl Acetate, Limonene, Linalool. 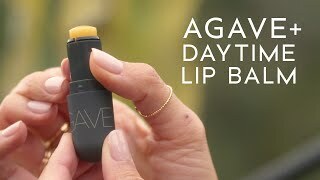 Agave+ Weekly Lip Scrub Ingredients: Sucrose, Squalane, Glycerin, Helianthus Annuus (Sunflower) Seed Oil, Caprylic/Capric Triglyceride, Aqua/Water/Eau, Aroma/Flavor, Vanilla Planifolia Fruit Extract, Sucrose Laurate, Papain, Vanilla Tahitensis Fruit Extract, Tocopherol, Maltodextrin, Agave Tequilana Leaf Extract, Sodium Benzoate, Sodium Metabisulfite.